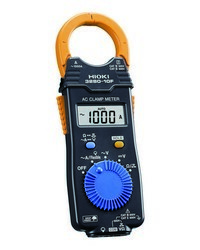 AC Current: "41.99 to 1000 A, 3 ranges (50 to 60 Hz, Average rectified), Basic accuracy: ±1.5 % rdg. ±5 dgt." DC Voltage: "419.9 mV to 600 V, 5 ranges, Basic accuracy: ±1.0 % rdg. ±3 dgt." AC Voltage: "4.199 V to 600 V, 4 ranges (45 to 500 Hz, Average rectified), Basic accuracy: ±1.8 % rdg. ±7 dgt." Resistance: "419.9 ? to 41.99 M?, 6 ranges, Basic accuracy: ±2 % rdg. ±4 dgt." Other functions: "Continuity: Buzzer sounds at 50 ? ±40 ? or less, Data hold, Auto power save, Drop-proof from height of 1 meter"
Display: "LCD, max. 4199 dgt., Display refresh rate: 400 ms"
Power Supply: "Coin type lithium battery (CR2032) ×1, Continuous use 120 hours"
Dimensions and mass: "57 mm (2.24 in) W × 175 mm (6.89 in) H × 16 mm (0.63 in) D, 100 g (3.5 oz)"
Accessories: "CARRYING CASE 9398 ×1, TEST LEAD L9208 ×1, Coin type lithium battery (CR2032) ×1, Instruction manual ×1"